Hi guys! I just got a fun little new toy, this Polaroid tabletop tripod for my cell phone, and thought I’d try it out by doing my very first ever Periscope broadcast. 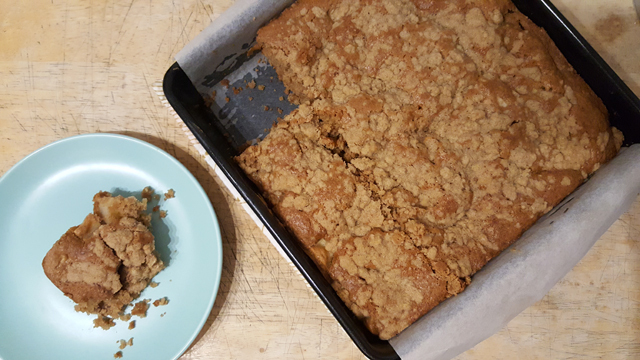 I made an apple cake last week for my husband’s coworkers that they LOVED, but I thought it needed a little refinement so I decided to make it again today and film it for whoever might be around. It was SO FUN. I will totally be doing this again. So if you have any cooking or baking techniques that you’d like me to demonstrate or any recipes you’d like to see me make, drop me a line in the comments and I’ll totally do it in a future broadcast. Anyway, like I said in the broadcast this apple cake recipe is really easy. It requires no special equipment except a scale. I mixed most of it with my hands. It took about 30 minutes to pull it together and takes about 30-40 minutes to bake. So it’s a great use for all those gorgeous new apples in the markets right now. The crumb topping is totally optional, but I like the little bit of texture it gives the top of the cake. Here’s the recipe for reference and the rewatchable broadcast. Hope you enjoy it! A super easy, super quick apple cake to get you in the mood for fall. From the 10/3/16 Periscope broadcast. 2. Grease and line a 20 cm or 9 in square baking pan with butter and line with parchment. 3. Peel, core and chop the apple. 4. Whisk together flour, baking powder, cinnamon, salt and light brown sugar. 5. Add the unsalted butter and egg. Combine with hands or a stand mixer if you have one. 6. Add the milk and apples. Combine with a wooden spoon. Pour into prepared pan and smooth out the top. 7. Sprinkle the crumb topping over the top of the cake and bake for 30-40 minutes or until a skewer or toothpick inserted into the cake comes out clean**. 1. Combine the flour, light brown sugar, white sugar, salt, cinnamon and unsalted butter with your hands or a pastry blender. 2. Sprinkle over the top of the cake. *Any baking apple will work. I used one Granny Smith and one Gala apple. **My cake took 35 minutes to bake.